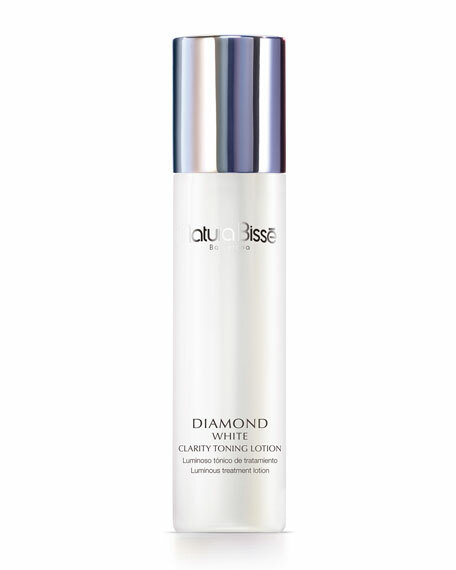 Natura Bisse Diamond White Clarity Toning Lotion, 6.76 oz. Natura BisseDiamond White Clarity Toning Lotion, 6.76 oz. Complete your face cleansing ritual with this gentle toner that restores your skin's natural brightness. A refreshing and hydrating lotion that minimizes pores, evens skin tone, and softens the skin. Pomegranate extract provides spectacular results and gives the skin a surprisingly radiant appearance. This exquisite formulation with a delicious lavender scent restores the skin's pH levels, improves microcirculation and reduces transepidermal water loss to help maintain deep hydration. For all skin types, age 30+. Use: After cleansing, use a cotton pad to apply toner or spritz it on your face neck and décolleté. Massage it softly until completely absorbed. Clinique Clarifying Lotion 2, 13.5 oz. Helps clear away pollution, and dulling flakes for smooth, glowing skin. Helps pores look their smallest. Skin accepts moisture better.